On behalf of my constituents in the State of Florida, I write to you to strongly oppose the proposed issuance of five Incidental Harassment Authorization (IHA) permits for companies planning to conduct seismic geological and geophysical surveys along the Atlantic coast. Issuance of these permits would authorize five companies to disturb, harm, or kill marine mammals, including the critically endangered North Atlantic right whale, which uses the waters off northeast Florida for breeding and calving grounds. Seismic airgun harassment has been shown to directly and negatively affect marine mammal species during the most vulnerable stages of their life history: during feeding, breeding, calving, and migration. The most recent science indicates that North Atlantic right whales are already at the brink of extinction, and seismic surveys could be the stressor to push the population beyond the tipping point. In the last month alone, seven of these critically endangered whales have been found dead off the coast of Canada, suggesting that the situation may be even more dire than even scientists realized. Moreover, recent studies indicate that the National Marine Fisheries Service has drastically underestimated the expected auditory and behavioral impact of airgun sounds to whales. There also is new scientific evidence that whale species that frequent the Atlantic Coast are more sensitive to such human-caused noise sources at the critical time when calves are nursing, growing, and gaining strength. Based on what has been scientifically proven in terms of direct negative effects of the proposed activities on cetacean species known to be present in the proposed survey areas, there is no way a reasonable person can conclude these activities “will have a negligible impact on such species” as is required in order to issue an IHA permit under the Marine Mammal Protection Act. Aside from the direct effects on whale species, there are also significant adverse secondary and cumulative impacts resulting from seismic testing. Recent studies indicate that the activities proposed to be conducted under these IHA permits could significantly and negatively affect zooplankton populations—which serve as an important food source at the bottom of the food web. This finding suggests that all levels of the food web from filter-feeding shellfish to all species of baleen whales could suffer. Given this fact, it comes as is no surprise that the South Atlantic Fishery Management Council, the Southern Shrimp Alliance, the Southeastern Fisheries Association, the International Game Fish Association, and others have all weighed in against allowing seismic surveys in the Atlantic. Florida has little to gain and much to lose if seismic surveys are allowed off the state’s coast. Tourists travel from around the world to visit Florida’s scenic beaches and the bountiful fishing that has made it the Fishing Capital of the World. That’s why more than 30 cities and counties in Florida have passed resolutions opposing offshore seismic testing and drilling. Citing both environmental and economic concerns, in 2015, countless Floridians recommended that the Department of the Interior delay or reject seismic permitting. Broad public opposition to seismic and scientific evidence regarding its potential harm has only grown since then. In fact, in the four years since the National Marine Fisheries Service completed consultation and in the three years since the Bureau of Ocean Energy Management completed its Programmatic Environmental Impact Statement, the available science has confirmed significant threats to marine mammals and endangered species on the Atlantic coast that would result from the proposed seismic activity, and these have not been considered by NOAA’s administrative process to date—a process that is lacking in meaningful public engagement and opportunity for comment. Given the significant environmental and economic risks, I strongly oppose the issuance of IHA permits for companies seeking to conduct seismic testing in the Atlantic. 1. See, for example, Pettis H.M. and Hamilton, P.K. 2016. North Atlantic Right Whale Consortium Annual Report Card. See also, National Marine Fisheries Service Northeast Fisheries Science Center. 2017. North Atlantic Right Whale: Western Atlantic Stock Assessment. 2. Kassam, Ashifa. 2017. Seven Right Whales Found Dead in ‘Devastating’ Blow to Endangered Animal, available at https://www.theguardian.com/environment/2017/jul/08/right-whales-dead-canada-endangered-species. 3. Blackwell, et al. 2015. Effects of Airgun Sounds on Bowhead Whale Calling Rates: Evidence for Two Behavioral Thresholds. 4. Videsen. et al. 2016. High Suckling Rates and Acoustic Crypsis of Humpback Whale Neonates Maximise Potential for Mother-Calf Energy Transfer. 5. 16 U.S.C. § 1371(a)(5) (2010). 6. McCauley, et al. 2017. Widely Used Marine Seismic Survey Air Gun Operations Negatively Impact Zooplankton. 7. Pursuant to section 7 of the Endangered Species Act of 1973,16 U.S.C. § 1536 (2010). 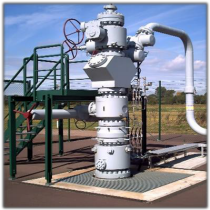 TALLAHASSEE, FLA—Sierra Club has formally asked the state Public Service Commission to reject FPL’s request to add a new fracked gas power plant in Dania Beach without doing the required analysis on whether the gas is actually needed. FPL has pursued this new gas generation without any meaningful investigation of the market price of incremental additions of solar, storage, or demand-side resources—as exemplified by its buildout of an all-gas peaking generation fleet. Sierra Club yesterday filed comments with the PSC, asking that commissioners either deny FPL’s request to be exempt from the requirement to test the market for other non-gas options, such as solar, or put the request on hold until FPL files more information about how it will provide the missing information regarding other options, including current market prices. Nearly 70 percent of FPL’s electric generation relies on gas, while only about 1 percent comes from cheap, clean solar power. Diversification through cost-effective solar, storage, and demand-side resources would strike at the heart of the problem of gas price volatility and protect families and businesses from unpredictable price spikes. The U.S. Fish and Wildlife Service has announced that it will review whether Florida panthers are still an endangered species. The review, which is required every 5 years under the Endangered Species Act, comes amid growing calls from hunters and ranchers to take the big cats off the endangered species list in response to population growth. Though the population has increased from perilously low numbers due to the protections provided by the Endangered Species Act, its numbers and distribution are still far too limited to secure the Florida panther from extinction. The Florida Fish and Wildlife Conservation Commission has increased its estimate of the Florida panther population to as many as 230 adults, most of them in Southwest Florida. 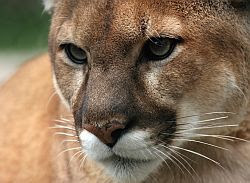 Sierra Club Florida and other state wildlife protection organizations have long worked to protect the Florida panther’s population through land conservation and its listing as an endangered species. “If Donald Trump's US Fish and Wildlife Service removes endangered species status for the panther, it would open the door to the intentional slaughter of Florida's big cats. We won't let this happen!" said Sierra Club Florida Director Frank Jackalone. The current federal recovery plan for Florida panthers requires at least two breeding populations of 240 panthers each before the panther can be listed as threatened instead of endangered; three such populations are required before the panther can be taken off the list altogether. In March, FWC downgraded the status of the manatee from endangered to threatened. Despite its seeming “comeback,” the relatively small population of panthers continues to be decimated by cars. In 2015, a record 30 panthers were hit by cars and killed. In 2016, 32 were killed by cars, and the total number of panther deaths combined was 42 (road kills and other causes). As part of the status review, new information may be submitted about population trends, habitat conditions, and threats until August 29. Sierra Club’s legal team will be submitting a detailed legal comment letter, Jackalone added. Will Trump’s lust for oil kill Flipper? The shattering blasts come every 10 seconds, 24 hours a day, for weeks on end. The Trump Administration wants to allow the use of seismic airgun blasting to map the ocean floor from Florida to Delaware in the search for oil and gas, and recent testimony by Secretary of the Interior Ryan Zinke at House Natural Resources Committee has made it clear that seismic testing in the eastern Gulf of Mexico will follow next. Giant air horns, so loud they would shatter the human ear, generate blasts of up to 250 decibels reaching miles into the sea. Experts say the blasts impair hearing in marine mammals responsible for their navigation, communication, eating, and mating and would injure or kill 138,000 dolphins and whales. It would pose risks to nesting female and young sea turtles, whose behavior is altered by low-frequency seismic sounds. It would also decimate fisheries along our coast and kill off zooplankton, the foundation of aquatic life, for 135,000 square miles. The U.S. Department of Interior’s very own studies estimate airgun blasting will cause 13.5 million instances of harm to Atlantic marine mammals, including the right whale, which makes its breeding ground off the coast of Florida. There is evidence to support this. In Madagascar and Peru, mass beachings took place around the time of airgun testing. In 2008 in Madagascar, dozens of whales washed up on shore. 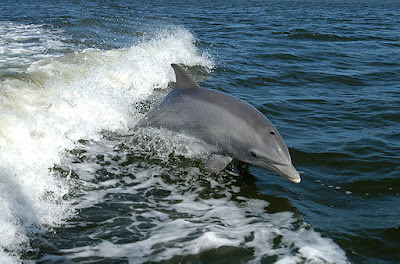 In 2012 in Peru, 900 dolphins and porpoises washed ashore. Necropsies showed blood coming from ears and fractures of ear bones. Airgun blasting endangers more than whales and fish themselves. It kills off what they eat. A study released last week by the journal Nature showed the blasts would destroy the majority of zooplankton species, the base of the food chain, within about 1.5-miles of each medium-sized airgun, impacting 135,000 square miles next year alone. Zooplankton provide food for fish and whales. South Carolina Governor Henry McMaster, a Republican, has publicly opposed Trump’s plan for Atlantic airgun blasting to open up offshore drilling. In Florida, nearly 40 cities and counties have already passed resolutions from cities including Jacksonville Beach, Ft. Lauderdale and Pensacola and counties including Flagler, St. Johns, Indian River, Martin, Palm Beach, Broward and Miami-Dade. And it’s not just local governments. Even the State of Florida in 2015 recommended delaying airgun permits due to insufficient data on the impact on natural resources. There is a bi-partisan consensus that tourism and fisheries are the heart and soul of our coastal economy. Clean water and beaches and healthy marine life are not compatible with airgun blasting or oil and gas extraction. Florida and Atlantic coast officials have seen what has happened to the coasts of Louisiana, Texas, Alabama and Mississippi. They’ve seen the oil storage containers, pipelines and transportation systems. They know the physical blight of offshore rigs and their coastal infrastructure are only surpassed by the inevitable spills, explosions and disasters to follow. They don’t want a BP disaster on the Atlantic coast. In addition to the direct impact of airgun testing and offshore oil and gas, once burned these fuels add to greenhouse gases leading to increasing rates of sea level rise. However you look at it, Florida loses. Airgun testing is unleashing a frenzy of oil wildcatters with an ocean of marine mammals as collateral damage. Floridians need to coalesce around this issue. We need to talk about it with our friends. Post it on Facebook. Call our representatives, locally and in Congress. Join protests. Unite with business owners. Raise a ruckus. The good news is that there is no need for airgun blasting or offshore oil drilling. The fastest growing form of energy is not oil or gas, but renewables like solar and wind. We have the ability to produce energy without threatening our coasts. Frank Jackalone is the Florida Chapter Director of the Sierra Club. What can you do to stop this tragedy? itp.laws@noaa.gov by the July 21 deadline. The U.S. Conference of Mayors approved a historic resolution that establishes support from the nation’s mayors for the goal of moving to 100% clean and renewable energy in cities nationwide. Meeting June 23-26 in Miami Beach, the Conference hosted leaders from more than 250 cities. 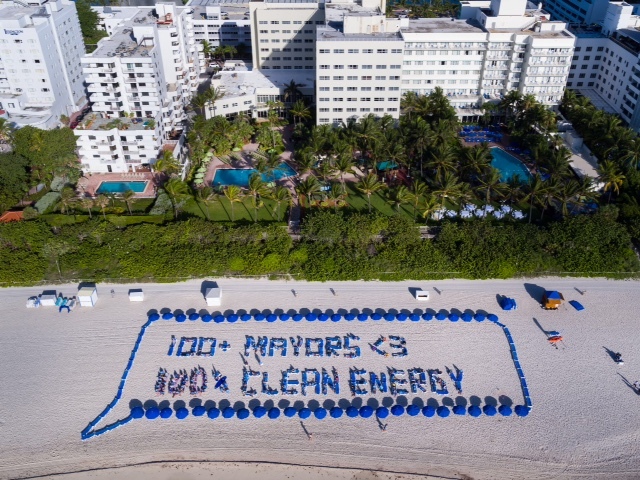 The weekend kicked off with Sierra Club’s “Sunrise for Solar,” a human aerial art image on the beach behind the conference hotel, which aimed at encouraging the U.S. Conference of Mayors to adopt the resolution. The bipartisan group of mayors unanimously backed the commitment for U.S. cities to run entirely on renewable sources such as wind and solar in two decades. 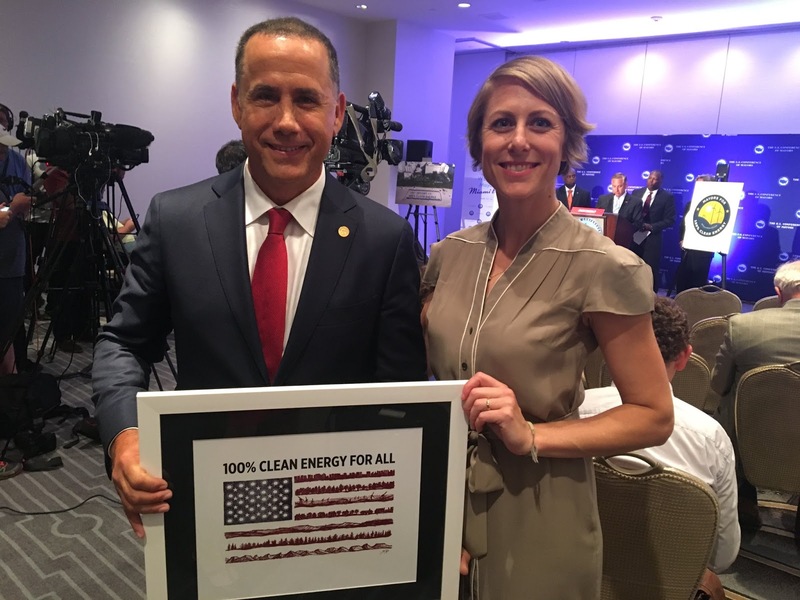 The Sierra Club’s new Mayors for 100% Clean Energy campaign was launched nationally this spring and is co-chaired by Miami Beach Mayor Philip Levine. Jodie Van Horn, national Sierra Club organizer of the Ready for 100 campaign, attended the conference, and met with a group of Sierra Club leaders from across the state. So far, 36 cities across the United States have now committed to transition to 100% renewable energy, and 129 mayors have signed onto this vision. “Cities don't need to wait for Washington, D.C. to act in order to move the ball forward on clean energy,” said Sierra Club Executive Director Michael Brune. Sierra Club’s Emily Gorman worked tirelessly, along with a core team of volunteers, to pull off the early-morning aerial art on the beach. It required renowned aerial artist John Quigley to create the design to scale and organize over 100 volunteers to form the letters in the sand with the aid of beach chairs and umbrellas. The image was broadcast nationally on news outlets and social media. Past measures at the U.S. Conference of Mayors have been instrumental in setting standards and providing resources to cities, says Gorman. 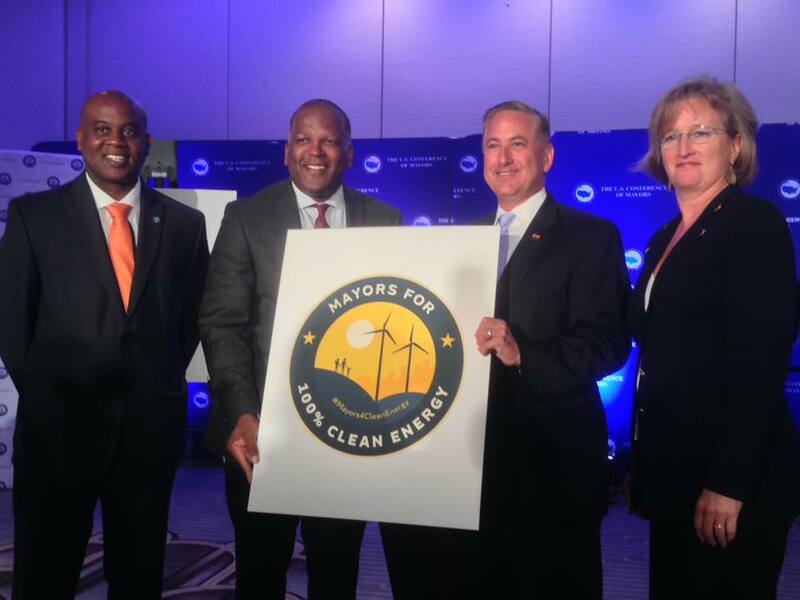 The Energy Efficiency and Conservation Block Grant (EECBG) Program, for example, was the result of efforts at the U.S. Conference of Mayors. For the first time in U.S. history, the EECBG program made it possible for cities, counties and states to receive grants specifically to fund energy-efficiency projects. 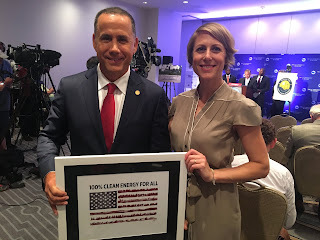 Sierra Club Florida has the support of many other environmental groups and community organizations across the state involved in the Ready for 100 clean energy campaign. 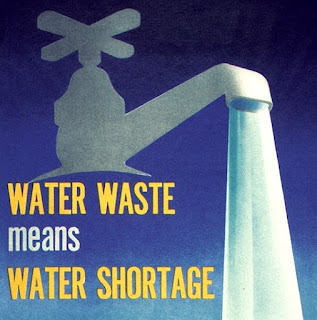 “Don’t waste water.” That message has been hammered into our heads since we were children. Yet, to our dismay, a few weeks ago, without public notice, Governor Scott’s hand-picked board members at the South Florida Water Management District (SFWMD) decided to go it alone on a plan to dispose of billions of gallons of untreated freshwater permanently by pumping it deep into the earth - water needed for the Everglades, Florida Bay and our drinking water supply. The move came after the US Army Corps of Engineers (Corps) rejected further consideration of so-called Deep Injection Wells. The Corps’ decision did not sit well with SFWMD board members, who seem much too eager to please Big Sugar and Big Ag interests. Last August, the three largest Big Sugar corporations (US Sugar, Florida Crystals and Sugar Cane Growers Cooperative) requested deep injection wells be included in the Lake Okeechobee Watershed CERP project. Soon after, as many as 100 deep injection wells were under consideration, with estimated construction costs as much as one billion dollars. But, the Corps, recognizing the risk of limited hydrogeologic data in the proposed project area, rightly decided to drop deep injection wells from further consideration. Instead, they recommended a comprehensive study to evaluate potential system-wide impacts to the Everglades ecosystem. The Boulder Zone, where water would be dumped 3,000 feet down, is supposed to be confined. But, this layer could be prone to vertical cracks that might allow untreated surface water to migrate back up into drinking water sources. Considering these uncertainties, it’s shocking how quickly the Governor and his water managers want to move forward with this. Just four months ago, when faced with an intense drought, the SFWMD said it was “operating the system to save as much water as possible.” If we are constantly prone to droughts, why would Scott’s water managers want to squander freshwater? They claim that doing so would help reduce Lake O discharges to the estuaries during extreme wet events. However, this dumping-water “solution” will create new regional problems. The injected water will take centuries to reach the sea and surface again. It will not be available in our lifetime, or even in our children’s lifetime, to recharge our aquifers, our rivers, our wetlands, or even to give us rain. Big Sugar and Big Ag will stop at nothing to avoid selling any more land, whether north or south of the Lake. What is surprising is the extremes they would go: to deprive the public of billions of gallons of water in an age of recurring and intensifying droughts. We all desire a stop to harmful Lake O discharges to the estuaries, but the solution is not to create a new problem. Deep injection wells will divert dollars needed to restore wetlands, to supply water during droughts, to irrigate our crops, to send more clean water south to the Everglades and Florida Bay, to replenish the drinking water aquifer for millions, and to fight saltwater intrusion and sea level rise. Governor Scott’s water managers say the state will pay for all of it. Let’s demand our money be spent on real Everglades Restoration. Diana Umpierre is Sierra Club's Everglades Organizing Representative. She can be reached at: diana.umpierre@sierraclub.org. To find more about why Sierra Club opposes deep injection wells in Everglades Restoration, check out our position statement. 2) Write a “Letter-to-the-Editor” (LTE) in your local news in South Florida to express why you do NOT support the use of deep injection wells in Everglades Restoration. It’s easy, it’s fast: it makes a difference! Click here for quick How-To. Contact us if you would like more writing tips, or want to get more involved in restoring our precious jewel: the American’s Everglades, our River of Grass.